"No one comes close to James Bond, 007." A rogue mine strikes the British spy ship St. Georges, sinking her and killing all aboard. The ship holds a device called ATAC, which can send messages to the Royal Navy's fleet of nuclear missile subs. If the Russians can retrieve it, Britain's entire nuclear force could be compromised. The British Secret Service assigns a marine archaeologist to recover ATAC. Before he can embark on this mission, he and his wife are gunned down by a hitman. After surviving an assassination attempt by an old enemy, James Bond, 007, is assigned to get the ATAC. While tracking down the murderer of the archaeologist and his wife, Bond runs into their daughter, Melina. Together they travel across Italy and Greece in an effort to retrieve the ATAC. Standing in their way are mobsters, assassins and a psychotic diver. The trail leads to a mountain fortress, and a desperate assault with the security of the United Kingdom hanging in the balance. 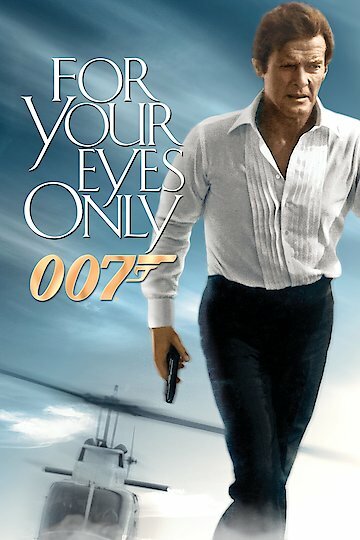 For Your Eyes Only is currently available to watch and stream, download, buy on demand at Netflix, Amazon, Vudu, Google Play, FandangoNow, iTunes, YouTube VOD online.